Take part in our free competition to celebrate Fire Door Safety Week! 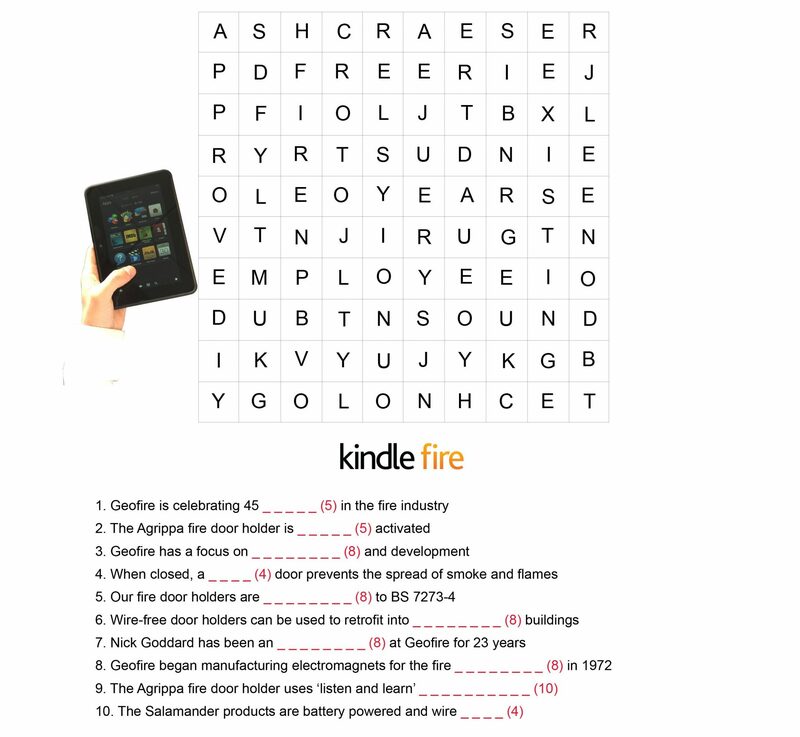 Complete the word search below and send us your answer to be in with a chance of winning a Kindle Fire. If you get stuck, use the Fire Door Safety Week news story to help you. To win, write down the first letter of each word (10 letters in total). 1.These terms & conditions (the “Terms”) apply to all participants in the Geofire word search promotion (the “Promotion”). 2.The organiser of the Promotion is Stephenson Gobin, a company registered in England & Wales with company number 01061427 and registered address at St Peters, Newcastle upon Tyne, NE6 1BS (“Stephenson Gobin”). 4.The Promotion is open to residents of the United Kingdom aged 18 or over as at the Commencement Date. 5.Entry to the Promotion is free of charge and is not conditional on the purchase or use of any products of Stephenson Gobin. 6.The directors, management and employees of any entity within Stephenson Gobin and any third party involved in the organisation of this Promotion, as well as their immediate families, are not entitled to participate in the Promotion. 7.Only one entry per person will be accepted. 8.Stephenson Gobin at its sole discretion may disqualify any entrant to the Promotion where it suspects that the entrant has breached any of these Terms. 9.In order to enter the Promotion, you should complete a word search and then submit your answer to the anagram, along with your contact e-mail address to enquiries@geofire.co.uk. 10.Entries will be accepted from 00:00 on 25th September 2017 (the “Commencement Date”) to 23:59 on 1st October 2017 (the “Closing Date”). Entries received before the Commencement Date or after the Closing Date are invalid and will not be accepted. Stephenson Gobin shall not be responsible for any entry submission failures caused by technical errors. 11.By entering the Promotion, you hereby warrant that your entry does not contain any content which (a) is plagiarised from or otherwise infringes the intellectual property of any third party or contains any third party material or content for which you have not obtained all necessary licenses, consents and/or approvals; (b) is defamatory, obscene, indecent, pornographic, abusive, liable to incite racial hatred, discriminatory, blasphemous, in breach of confidence and/or in breach of privacy; (c) constitutes or encourages conduct that would be considered a criminal offence, give rise to civil liability, or otherwise be contrary to the law of or infringe the rights of any third party, in any country in the world; or (d) is technically harmful (including, without limitation, containing computer viruses). 12.By entering the Promotion, you agree that any personal data you provide to Stephenson Gobin, along with the information submitted as your entry to the Promotion, may be used to administer the Promotion and for the purposes of promoting and/or marketing the Stephenson Gobin brand and business. By entering the competition you consent to receiving marketing communications from Stephenson Gobin. 13.The winner will be determined by Stephenson Gobin in its sole discretion from and selected randomly from all eligible entries. 14.The winning entry will be chosen and notified by e-mail no later than thirty (30) days after the Closing Date. The winner will be contacted for confirmation that they accept their prize and for any supporting information or actions that may be required, such as a delivery address. Failure to provide such information to Stephenson Gobin’s satisfaction within 5 days of receipt of the email may result in the prize being forfeited and Stephenson Gobin choosing to re-run the selection process to choose an alternative winner. If you win you consent to your name being shared on the Stephenson Gobin Website and the Stephenson Gobin Twitter, Facebook, LinkedIn and Google+ pages. 15.Failure to comply with the requirements set out in these Terms may result in a winner being disqualified and an alternative winner being chosen in their place. In addition, Stephenson Gobin reserves the right, at its sole discretion, to refuse to award any prize to any winner who has or, is deemed likely to have, violated any term or rule outlined in these Terms, gained unfair advantage or won the Promotion using fraudulent or unfair means. 16.The prize is an Amazon Kindle Fire. 17.Receipt of the prize is conditional upon the winner accepting the prize within five days of being contacted by Stephenson Gobin in accordance with Section 14 above. 18.The value of the prize is based on the recommended retail value or market value as at Commencement Date. The prize is non-refundable and no cash alternative will be given. Where any element of the prize is unavailable, an alternative of equal value will be provided. Any extra costs beyond the value of the prize as outlined in these terms will be the responsibility of the winner. 19.In the event that the winner, for any reason, does not accept the prize or any element thereof, then the prize (or the relevant element) will be forfeited by the winner and neither cash nor any other form of compensation will be supplied in lieu of that forfeited prize (or the relevant element). 20.Stephenson Gobin accepts no responsibility for any tax implications that may arise from accepting any prize and advises entrants that independent financial advice be sought in the event of winning. 21.By accepting a prize, the winner accepts full and complete responsibility for their own safety and welfare at all times and, to the fullest extent permitted by law, agrees that Stephenson Gobin shall not be liable or responsible for any risks or damages associated with or arising out of the winner’s acceptance of the prize. 22.If you would like to receive a copy of these Terms free of charge, please contact us at the following address: 20 Longfield Road, South Church Enterprise Park, Bishop Auckland, County Durham, UK, DL14 6XB. 23.All selections and decisions made by Stephenson Gobin in conjunction with this Promotion are final and binding and no discussions will be entered into or correspondences entertained in this regard. 24.Stephenson Gobin shall be entitled to terminate or modify the Promotion or these Terms at any time prior to the Closing Date by publishing any such modification or termination on the relevant Stephenson Gobin website or otherwise communicating it in writing to entrants. 25.If any act, omission, event or circumstance occurs which is beyond the reasonable control of Stephenson Gobin and which prevents Stephenson Gobin from complying with or fulfilling any element of these Terms (“Force Majeure Event”), Stephenson Gobin will not be liable or responsible in respect of such Force Majeure Event. 26.Except in respect of liability for death or personal injury caused by its negligence, for its fraud or fraudulent misrepresentation or for any other liability which cannot be excluded by law, Stephenson Gobin will not be liable for any losses, damages, expenses, costs or claims arising out of or relating to the Promotion or the use of any prize, whether in contract, tort (including negligence), breach of statutory duty or otherwise. 27.These Terms and the Promotion are governed by the laws of England & Wales and are subject to the non-exclusive jurisdiction of the courts of England and Wales.